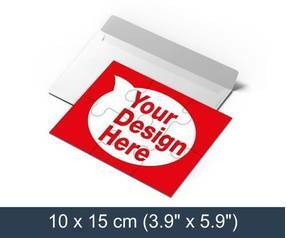 Promotional jigsaw puzzles are all about invitations, greeting cards and marketing! When creating promotional jigsaw puzzles you are making stand-out invitations to a wedding, birthday celebration, or corporate event. Invitees must assemble the pieces of the puzzle to learn the details of the event. The activity of solving the puzzle and the uniqueness of the invitation format are sure to make the event more memorable. Currently, there are two different puzzle sizes available for promotional jigsaw puzzles, the minimum order quantity is 10 units. There are four different piece counts available – 15, 9, 6 or 4 pieces. Each puzzle is packed into a white, blank envelope. Promotional jigsaw puzzles will become memorable invitations and advertisements that deliver your important message (and may cause your recipients to smile, too). That’s good for business! 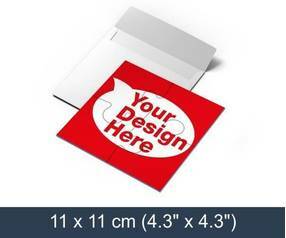 To start creating your promotional jigsaw puzzle select jigsaw size and upload a photo, design or artwork! When does an ordinary invitation or greeting card become memorable? When it arrives in the form of a promotional jigsaw puzzle from PuzzlesPrint! Promoting ideas, events, and opportunities! Promotional jigsaw puzzles are fun and memorable ways to keep your business, product, or service in the minds of current and prospective clients. Solving a jigsaw puzzle incorporates physical movement while engaging both sides of the brain in continuous activity. When the recipient works to solve the puzzle with your company logo, product image, greeting, or event invitation printed on the puzzles surface, that image or message is imprinted in the mind of the recipient. Use promotional jigsaw puzzles as stand-out invitations to a wedding, birthday celebration, or corporate event. Invitees must assemble the pieces of the puzzle to learn the details of the event. The activity of solving the puzzle and the uniqueness of the invitation format are sure to make the event more memorable. Giveaways are often essential to promoting a product or company at trade shows. Promotional jigsaw puzzles imprinted with your important contact information and logo will be engaging reminders to all recipients of you and your company or product. Artists and photographers can use jigsaw puzzles to promote their art and services, too. Make them magnetic or plastic! Take the uniqueness of promotional jigsaw puzzles up a level: order them with a magnetic surface. Your magnetic promotional jigsaw puzzles may wind up as fridge art or a puzzle to assemble and reassemble on a whiteboard or a metal file cabinet – who knows? The important thing is that your name and message “stick” in people’s minds. Plastic promotional jigsaw puzzles will be much durable than standard cardboard jigsaws.